The market conditions are changing at a rapid pace and it becomes important to adapt yourself to changing needs and requirements. If you have managed to land for an interview, make sure you give your best shot by avoiding some common interview blunders. 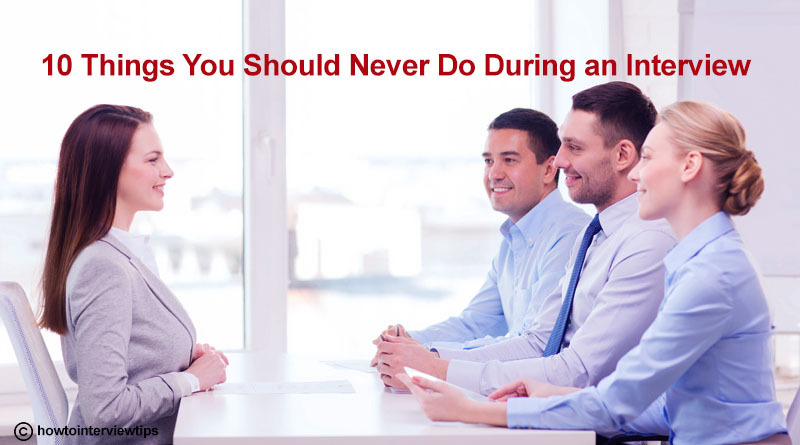 Here are the 10 most essential things you should never do during an interview. No surprises for guessing, that you just cannot show up late for a job interview. In fact, it is better to arrive 5 to 10 minutes early which gives you time to gather your thoughts. You should spend some time online, researching about the company and position you are applying for. Prepare a list of the questionnaire which you might ask during the course of an interview. You must ensure that you keep your phone in silent mode as it could cause the distraction. Even putting the phone in vibrating mode is not considered a good practice. It is always advised to keep your mood and spirits high as it leaves a positive impact on your personality. To be honest, don’t spoil your interview by saying things which might not please the person taking your interview. When you are in doubt, discuss your queries rather than saying rubbish stuff. Listening is an underrated skill. Make sure that you listen carefully before putting across any questions or doubts. Formal attire or proper professional dressing sense is always advised when you are appearing for an interview as it leaves a good first impression. Why would any new employer appreciate you when you are talking negatively about your previous employers or blaming them for your career’s negatives? If something was not right, simply state differences in personalities or work culture. Lean slightly forward when interacting with your interviewer and avoid sitting in bad postures. Modulate your voice to show emphasis or excitement when you are putting across your point. Employers always prefer energetic individuals.